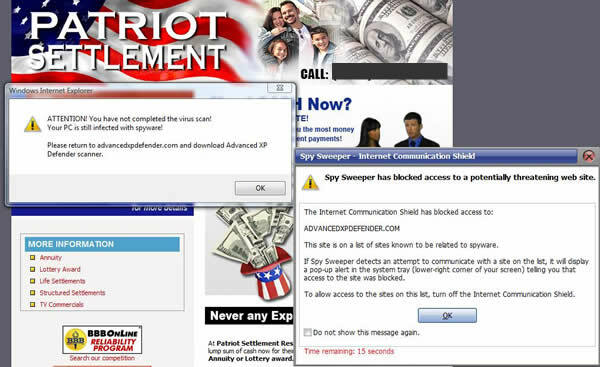 Patriot Settlement appears to have been hacked over the weekend and is now spreading a series of malicious software from their website. From this author's research, the Trojan virus that effects an individual's computer when visiting the site, is not hosted on PatriotSettlement.com's servers. Google and the other search engines are providing warnings at this time when Patriot Settlement's website shows up in the natural rankings, but Google is not currently showing a warning for Patriot Settlement's Pay Per Click program which serves the same website as the natural rankings. This virus will most likely effect more than 300 individual's computers today alone. Update: Patriot Settlement has fixed the virus and is awaiting Google and the other search engines to update the changes.